Passengers given a glimpse behind the hoardings at London Bridge as the station team gears up for engineering work this Easter. The station?s £1bn redevelopment, part of the Thameslink Programme, is currently in its final phase ahead of completion in 2018. This will mean closures and changes to services over Easter, both May bank holidays, August and December, as Network Rail continues to rebuild London Bridge and the surrounding railway. Since January, great progress has been made on the final section of the new, street-level concourse, which will open in January 2018. 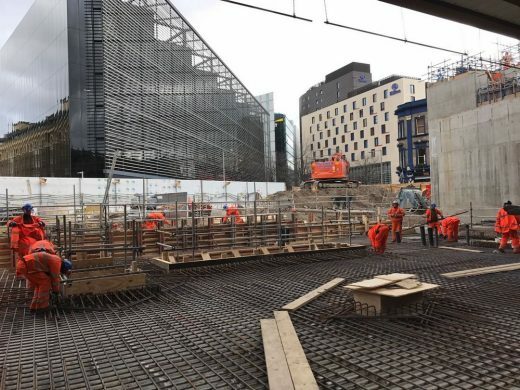 The foundations are being formed for the station façade and the lifts, stairs and escalators have been installed. The team has also been busy assembling the pre-cast bridge decks that will support platforms 1, 2 and 3, and building the steelwork sections that will form the canopies above.